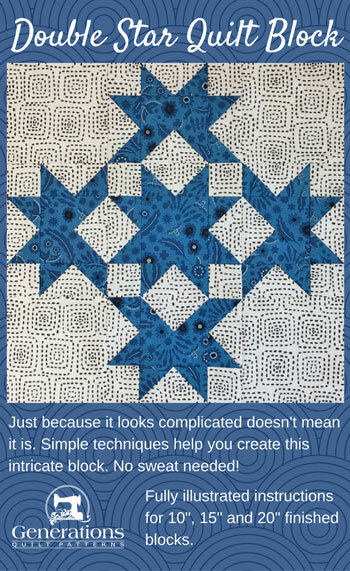 The Double Star block looks like it might take advance piecing skills. But don't let it fool you. 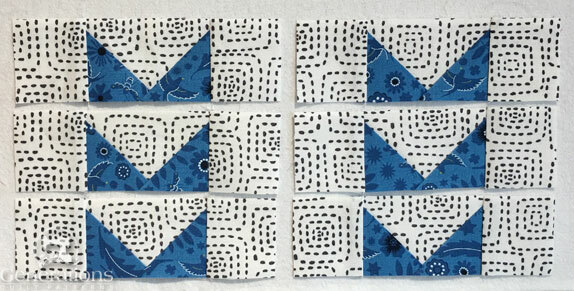 3-patch Quarter Square Triangles and Flying Geese are all it takes. That. And some cut squares. Now I have to admit. 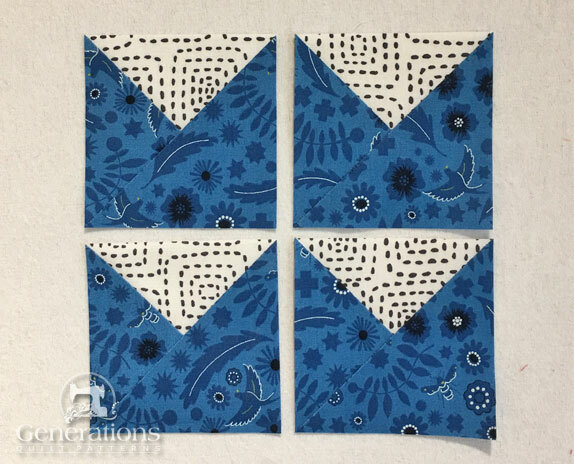 I was a doubting Thomas when I first considered creating a tutorial for this block. In reality, this block is nothing more than a bunch of steps, taken in order. That's it! 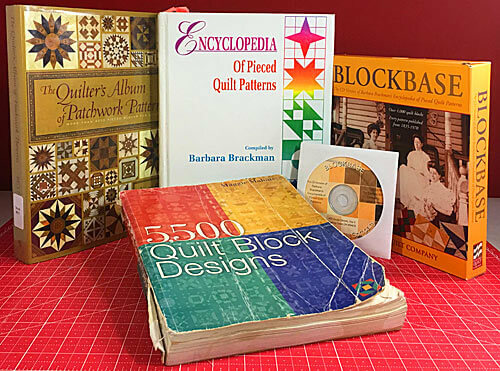 Later in the tutorial are variations on this block design. Not sure if you want to commit to making this block? 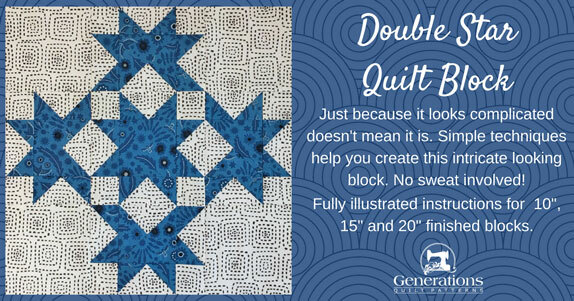 Then check out these 10 different Double Star layouts for inspiration. 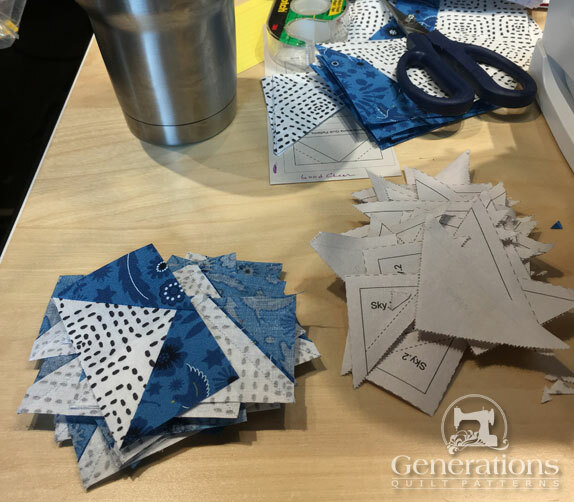 Without further ado, it's to to cut up and sew! When instructed to press, first press the patches in the closed position just as they came off your sewing machine. This sets the seam, melding the fibers of the threads into the fibers of the fabric. 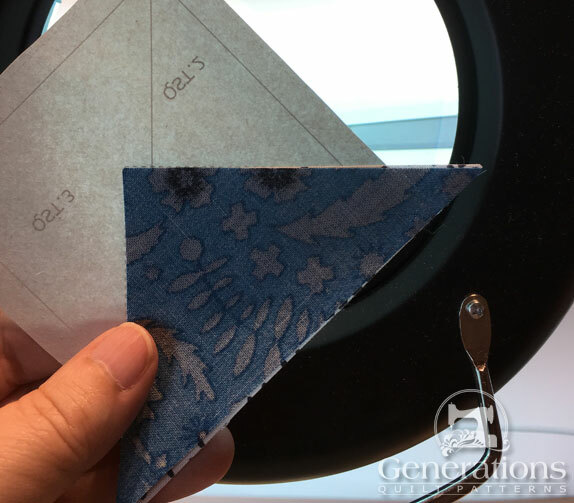 Starching the fabric with StaFlo concentrate mixed 50/50 with water before cutting makes patches easy to fingerpress. 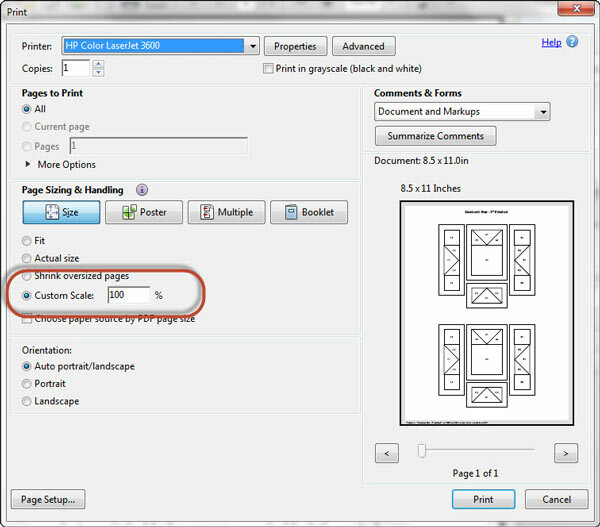 A big time saver for our simple paperpieced units. Learn more about starching fabric here. This design is all about pointy points—and matching points. Choose two fabrics with plenty of contrast between their color and pattern so that those precious points don't get lost. Make sure to label your patches as they are cut, especially after subcutting. While they might fill the space, you end up with bias edges on the outside of your units—defeating the purpose of precutting your patches. QST.1	 Light	 1	 3¾"	x	3¾"	 4¾"	x	4¾"	 5¾"	x	5¾"
QST.2	 Dark	 1	 3¾"	x	3¾"	 4¾"	x	4¾"	 5¾"	x	5¾"
QST.3	 Dark	 2	 3⅜"	x	3⅜"	 4⅜"	x	4⅜"	 5⅜"	x	5⅜"
Goose	 Light	 4	 3⅝"	x	3⅝"	 4⅝"	x	4⅝"	 5⅝"	x	5⅝"
Sky	 Dark	 16	 2⅜"	x	2⅜"	 2⅞"	x	2⅞"	 3⅜"	x	3⅜"
Choose your finished block size from the chart below and print the corresponding number of pages for a total of 16 Flying Geese and four 3-Patch Quarter Square Triangles units. 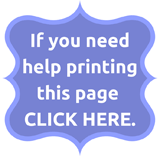 4 FG	 2" 1" x 2"
4 FG	 3" 1½" x 3"
4 FG	 4" 2½" x 4½"
After printing, use the 1" square graphic on the printed page(s) to confirm the patterns printed correctly. 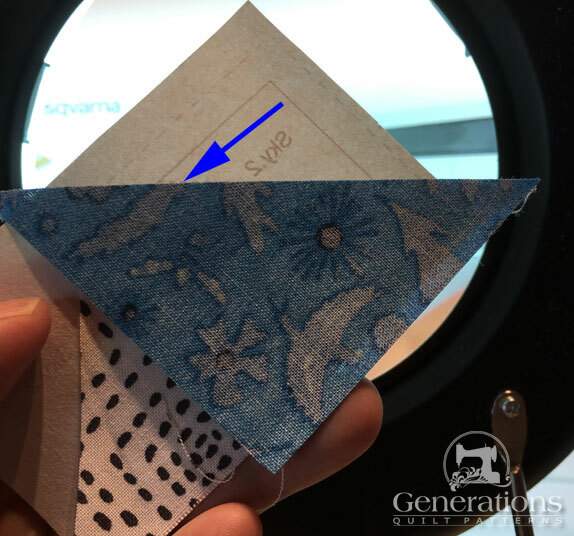 The dashed placement lines on the paperpiecing patterns save us a lot of extra trimming—in fact, you shouldn't need to trim any patches until the Flying Geese and 3P-QSTs are completely sewn. 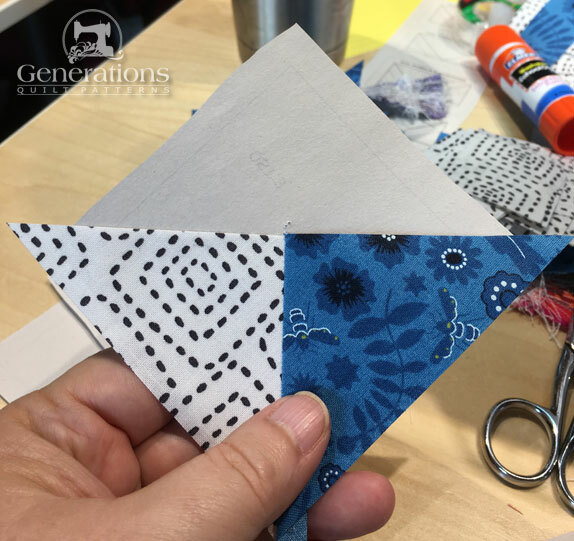 Use a dot of Elmer's Washable Glue stick to stick the backside of the Goose patch to the unprinted side of the pattern. Use the dashed placement guides to position it. 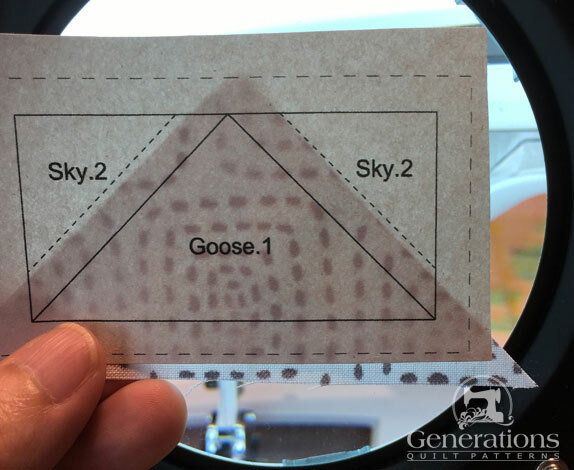 With RST, align the long edge of a Sky patch to the Goose patch. Stitch on the line between the Goose and Sky, starting and stopping a generous 1/4" before and after the line. Press. At this point there's no reason to trim anything. Not even thread tails. Those pesky tails are gone once the finished unit is trimmed to size at the end. Add the second Sky patch in the same manner and press. To trim to size, I like to lay as many FG as I can on my mat and trim en masse. Trim all four sides. Line up the quarter inch line on your ruler with the solid outline of the FG unit. All trimmed. Not a lot of fabric sacrificed for perfect little units. All that's left to do is remove the paper. Ready to use in our Double Star block. With just a tiny dab of Elmer's Washable Glue Stick, adhere the backside of QST.1 to the unprinted side of the pattern. Use the dashed placement lines to position the patch as shown below. Again. Close is good enough. 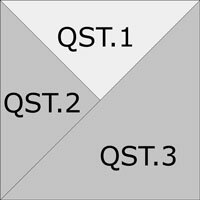 With RST, align the edges of QST2 with QST1. This time you're aligning a short side—that way the straight of grain is on the outside of the block. 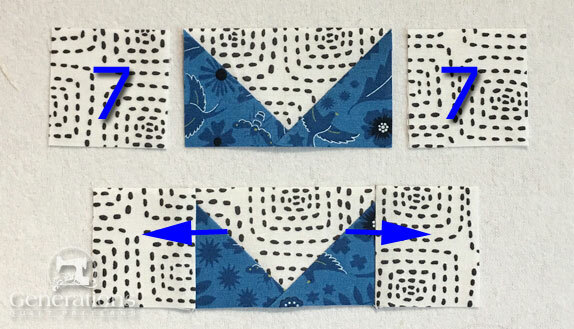 On the printed side, stitch starting and ending (blue arrows) a good 1/4" before and after the solid stitching line between QST.1 and QST.2. Press. Here I've been able to simply fingerpress because my patches are heavily starched and hold and excellent crease. 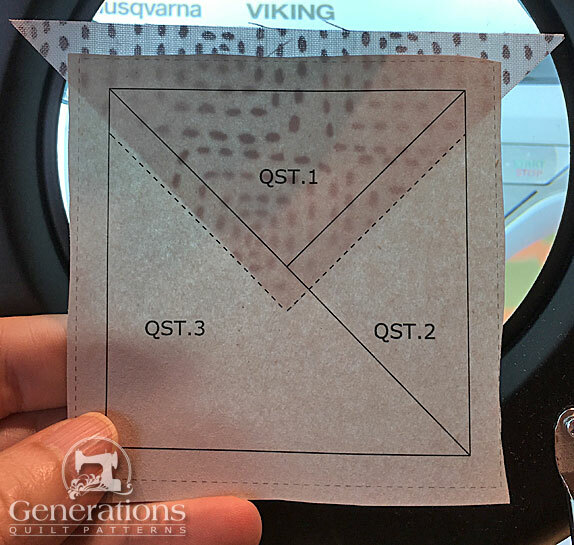 With RST, align the edges of the QST1/QST2 and QST.3. Stitch as before starting and ending a generous 1/4" past the solid stitching line. Trim the 3P-QSTs to size by placing the 1/4" line of your ruler on the solid outside line of the unit. Trim all four sides of each unit. When completed they look like this. Use the table below to check your accuracy. 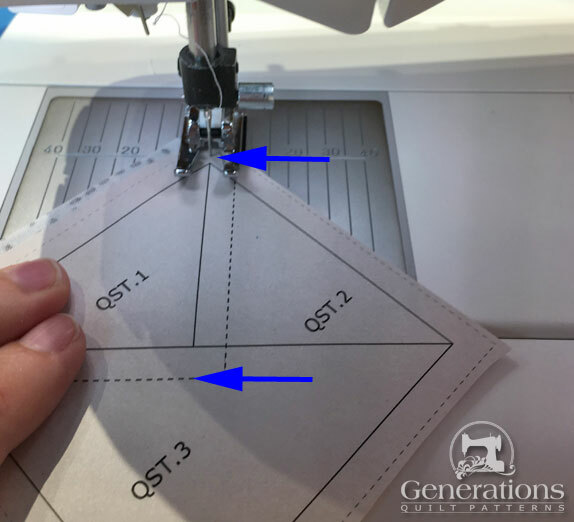 With RST, stitch a #7 to each side of a single FG.